Dry roast the ingredients one by one on medium low flame until the pepper starts cracking, cumin seeds starts turning golden, fennel seeds turns golden, cinnamon, cloves and cardamom totally fried for 5 to 7 minutes. Cool the mixture and grind them to a coarse powder and reserve for later use. Heat sesame oil and the sunflower oil together for 30 seconds and fry the chopped onions for 2 to 3 minutes until it turns golden. Later add the ginger garlic paste and fry for a minute. Now add the cleaned chicken pieces to the masala and add turmeric powder, curry leaves and little bit of salt. Mix well, cover and cook for a minute over medium low flame. Add the coriander powder to the chicken pieces and mix well. Saute the chicken for a minute and pour 1/3 cup (or enough to cook the chicken) of water, tomato cubes, mix well. Cover and cook until the water dries up and becomes thick and semi-dry. Finally add the ground powder(masala powder) to the chicken and mix thoroughly. Saute for 2 to 3 minutes just enough time to marry the masala with the chicken. Garnish with coriander leaves, may be squeeze half a lemon on top, combine well, switch off and serve hot. Tomato is not added for pepper chicken fry but I just added 1 no. of small tomato to have a even blend of masala's. The recipe I've dictated here is the total country style and it's must to use sesame oil for this recipe. Reduce the chopped onion and omit the tomato (else add the tomato just 2 minutes before switching off) if the chicken fry has to be dry. Looks so spicy and flavorful. Will give it a try sometime. liked your last two clicks dear.. samma clear presentation..
Like the new makeover of your blog shanvi. Milagu kozhi varuval is in my long time to-do list. Like your version too. Bookmarking. Love the spiciness in this dish. 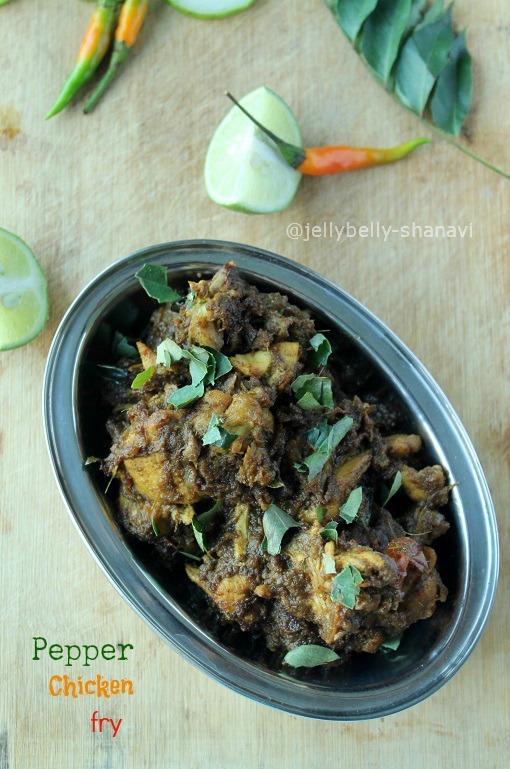 Love the last click..
Spicy delicious pepper chicken fry...Drooling here.. 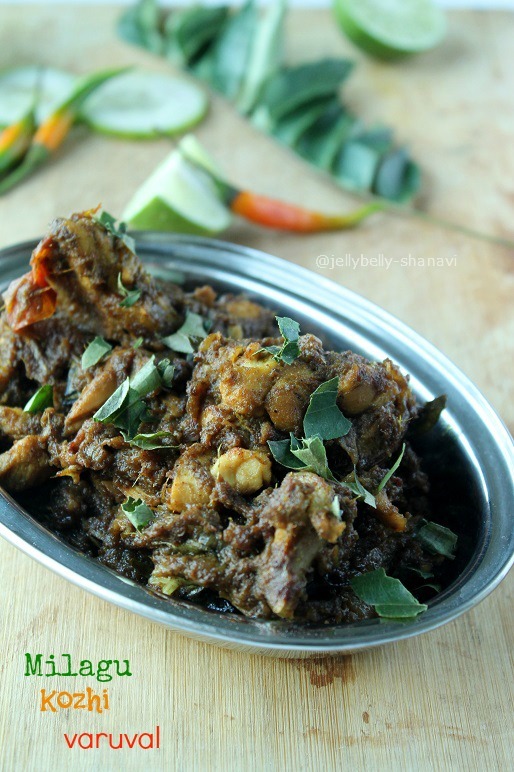 I am drooling, my saliva is almost dripping looking at this peppery chicken varuval. Perfect flavors and amazingly tempting and trilling to my palates. 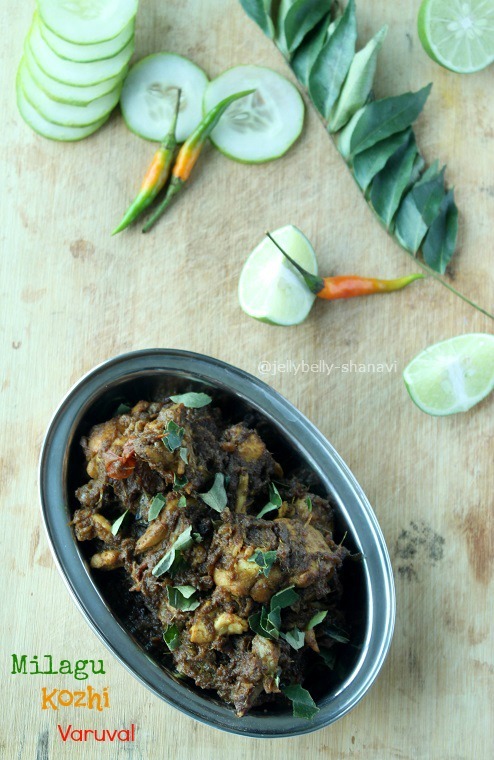 Slurp, cant take my eyes from ur clicks,super droolworthy and highly inviting.Fingerlicking milagu kozhi Varuval. Wow.. I am drooling.. Lipsmacking hot & spicy varuval.. BOokmarked dear !! Wow its simple. I tried it at home, it was delicious. Thanks for this great Pepper chicken recipe. Tried it yesterday. Yummy recipe! This was a great recipe and a fantastic hit with the family and friends. Made it really spicy. The second time I made it, I added a few red chillies to the masala for grinding. It was even more superb. Served it with ghee rice and hot mango chutney. Thank you Nisha for taking the time to pen down ur feedback. 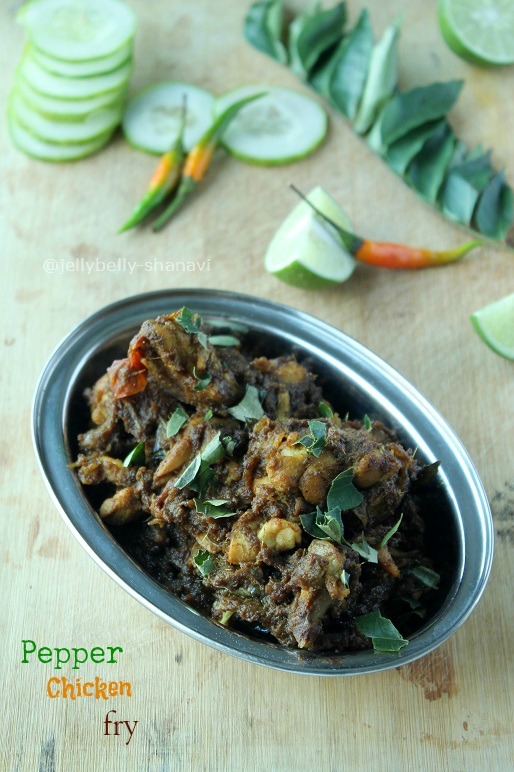 I loved the addition of addition of adding extra chillies glad that it u liked th erecipe. Feel free to check out other recipes as well.